4/22/2016 | Weekly Highlight: OKUMURA Hiromi 奥村博美 (1953- ) — dai ichi arts, Ltd.
Okumura Hiromi was born in 1953 in the artistically vibrant city of Kyoto, and thus was aware from a very early age of the avant-garde world of pottery due to the distinct influence of the Sodeisha group at that time. Okumura graduated from the Kyoto University of Art in 1978, and served as an assistant to Miyashita Zenji. Throughout the 1980s, a slew of public and private exhibitions led Okumura to an appointment as Professor of Ceramics at Kyoto Seika University, and his work was selected for the important traveling exhibition showcasing young Japanese talent, Japanese Pottery: The Rising Generation from Traditional Japanese Kilns. "I'm working on the tatara (sheets of clay sticking together). I accept and play with all those features of clay: wrinkles, folds, sags, finger marks, curved surface, and tension. And I hope I can express clay's potential, softness, and lushness." Okumura works with clay that contains fiber elements, which offers more flexibility and foldability in its wet stage. The artist plays with gravitational forces by seeming to defy them in his work. These pieces have a feeling of graceful uplift, almost as if they were textiles blown in the wind. Okumura achieves this playful feeling through a careful negotiation with gravity during the forming process. Both before and during firing, Okumura plays with the clay's potential, turning restrictions into creative opportunities. This large Ki is an unconventional piece. 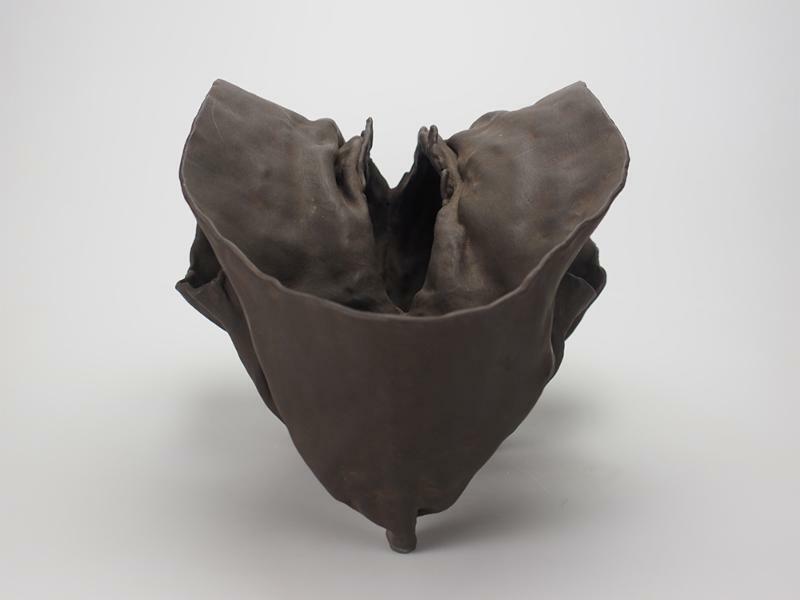 At first glance, one perceives in its amorphous shape the artist's exploration of the spatial relationship between interior and exterior, a key element of the traditional vessel form. And yet hidden among the work's myriad folds and wrinkles is a fully functional vessel, which can in fact hold flowers. The result is a delightful blend of abstraction and functionality that is in dialogue with both traditional forms and modernist ideas.